Enjoy all the excess floor space you will have when you purchase a White 4 Way Grid Spinner! Fill this rotating display with jewelry, novelty items or souvenirs. This display will definitely get your customers attention. 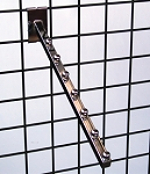 Included with your retail display stand are four wire panels with a half-inch center, sign holder and levelers along with the hardware to assemble. 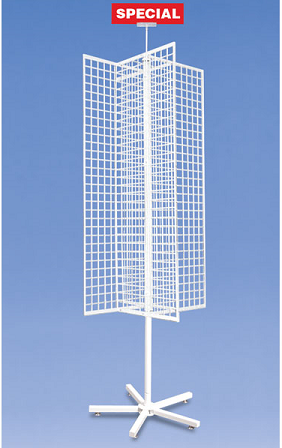 Our rotating floor rack is white and constructed of powder coated steel material. Each spinning retail rack only takes up about 18 inches of floor space while giving you peace of mind with your display. Featured in a white color, your items will truly stand out. If white is not your desired color, we also have this same freestanding fixture in black. Ordering is easy, just click to add to your cart now at Candy Concepts Inc.